Had the third reading of the HS2 bill in the House of Commons had more than 37 minutes for debate, its highly likely that the Transport minister would have said something along the lines of “we need more capacity on the WCML and you might as well make it high speed, even though that adds 10% to the cost”. Recently on the Beleben blog, he has been looking at capacity issues. On Friday evenings, people have to stand on some Euston intercity departures. But as can be seen, that must be a result of inefficient planning and operations management, rather than capacity shortage. 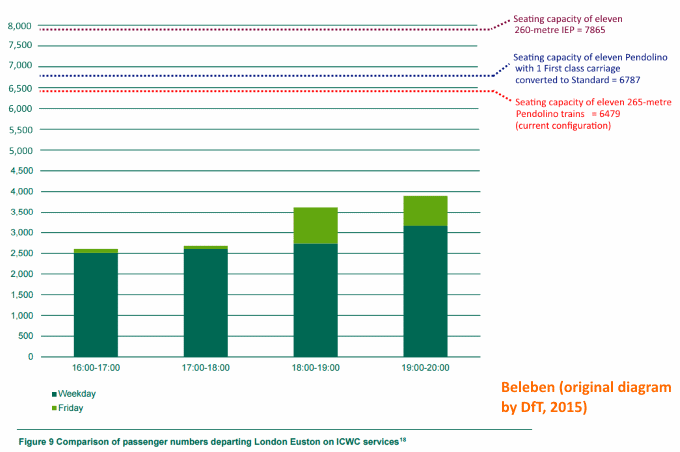 That is because eleven 589-seat Pendolinos, in their current configuration, would provide 6,479 seats each hour – well above the highest (Friday 19:00-20:00) passenger number in DfT’s Figure 9. He points out that changing some first class carriages to standard class would massively increase capacity available at the peak hours. What’s more, she points out that many of the HS2 trains would be sitting empty for much of the day. With a cost of £26.5 million for a 200m train set (in 2011 prices) this would be a £583 million siesta. PS The overall cost of HS2 is £55 billion – trains are only a small part of that cost. But non-HS2 trains could be used on lots of different lines, whereas HS2 captive trains will be usable only on HS2.